I hope everyone has been keeping tabs on the National Library of Australia / TROVE additions! 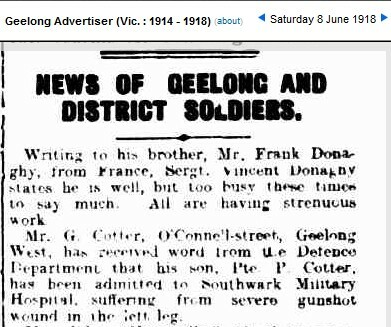 If not, you will have missed the start of the 1914-1918 copies of the Geelong Advertiser appearing. So far the uploads include part of 1917 and 1918 – keep watching and DON’T FORGET to register and do your bit by correcting as many entries as possible to make it easier for others to find their families. Thank you to the State Library of Victoria and the National Library of Australia – where would we be without them? I must confess to smirking last Thursday – sitting in the audience listening to an American genealogist – he was SO jealous of our NLA digital newspapers and TROVE!